One of the highlights of Motorola Z-series smartphones, which make them stand out, is the support for swappable Moto Mods. The Lenovo-owned phone maker has already launched a variety of Moto Mods, such as the Alexa speaker or Hasselblad camera add-on, but it might finally be looking to bring virtual reality to its Moto Z lineup. According to the images tweeted out by well-known tipster Evan Blass, popularly known as evleaks, Motorola may be planning to debut a virtual reality headset Moto Mod very soon. 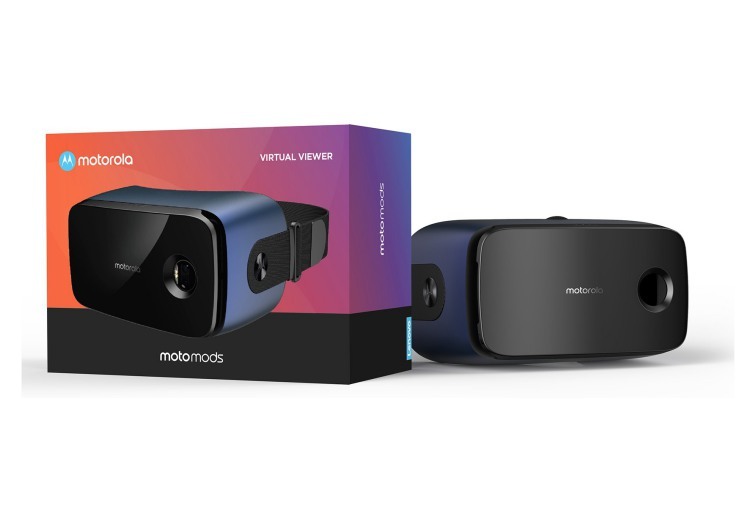 It is only the render attached above that has been made available to us by evleaks and all other details about this VR headset Moto Mod are quite sparse. VR is yet to hit mainstream as customer interest lingers around AR applications which do not always require extra accessories. But it will be interesting to see if a Moto mod can indeed change that, especially if Motorola makes good use of that camera cut-out. This sleek-looking VR headset Moto Mod may not be the only one the company is working on. We have earlier seen leaks that the company may also debut a DSLR-style camera Moto Mod, and an improved variant of their projector Moto Mod.